When you think of an aquarium it’s usually full of tropical fish, right? Many aquarists are setting up dedicated nano shrimp aquarium in addition to their normal fish tanks. We’re not talking about the kind of shrimp you cook and eat. Freshwater shrimp are relatively tiny compared to edible seafood varieties. Take the Neocaridina shrimp . They are quite colorful and have interesting behaviors that are fun to watch. They’re easy to care for and may even breed in your aquarium. A nano shrimp tank does not need to be large. That’s good news because aquarium manufactures are designing and producing a variety of modern, beautiful nano aquariums that are perfect for keeping freshwater shrimp. Looking for a different kind of aquarium? Maybe you just want a tiny, easy to care for tank. Read on! 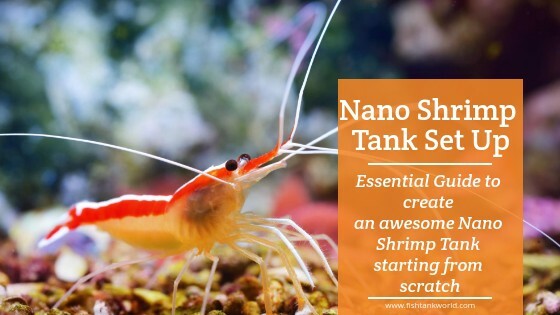 We’ll show you how to set up and care for your own beautiful nano shrimp aquarium. Welcome to the world of nano shrimp! Shrimp don’t need a large aquarium. A smaller aquarium keeps the shrimp population front and center for easy viewing. Nano aquariums fit in spaces that can’t accommodate traditional tanks. This opens up new possibilities for having a shrimp aquarium in your office, home, bedroom and just about anywhere. Nano shrimp aquariums are lighter in weight, so they can often be placed on a table top, counter or other relatively sturdy piece of furniture. Consider that each gallon of water weighs about nine pounds. So, while nano shrimp aquariums are lighter than traditional aquariums, they still require a sturdy spot capable of supporting the weight of the tank plus whatever else is on the shelf or table. If the surface is uneven, level the shelf or table before placing the aquarium on it. Never level the aquarium by placing coins or other leveling objects under the tank. Choose a level surface to eliminate undue stress on the glass. Using a stand like the Atra Flipper that you can check out on Amazon, can solve your problem. A potential trouble spot is a dresser or chest of drawers. A dresser is a popular spot in a child’s bedroom. The extra weight could make the dresser top-heavy. A curious child may try climbing on an open drawer, causing the dresser to fall forward. Also, opening and closing drawers creates disturbing shock waves through the aquarium. The shrimp my “jerk” in stress every time the drawer is opened and shut. So there is no need to place the tank in direct sunlight. This will also reduce the algae growth on the glass stimulated by the sunlight. 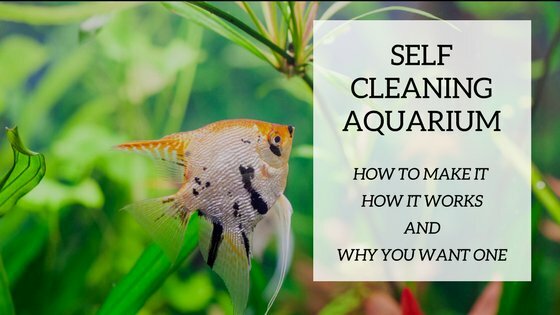 Check out our article on how to place an aquarium in your home. You’ll need a power outlet nearby for the light, filter system and heater. Use a high-quality power strip, positioned off of the floor and away from potential water drips. Be sure to configure all of the wires into a drip loop. All electrical aquarium products come with a manual describing how to set up a drip loop. The drip loop prevents water from running along the power cord and into the electrical outlet. Most homes and modern offices have efficient climate control systems. However, avoid placing the shrimp aquarium where it will be exposed to excess heat or cold temperatures. You can purchase a generic nano aquarium kit or piece together your own tank by selecting individual components. 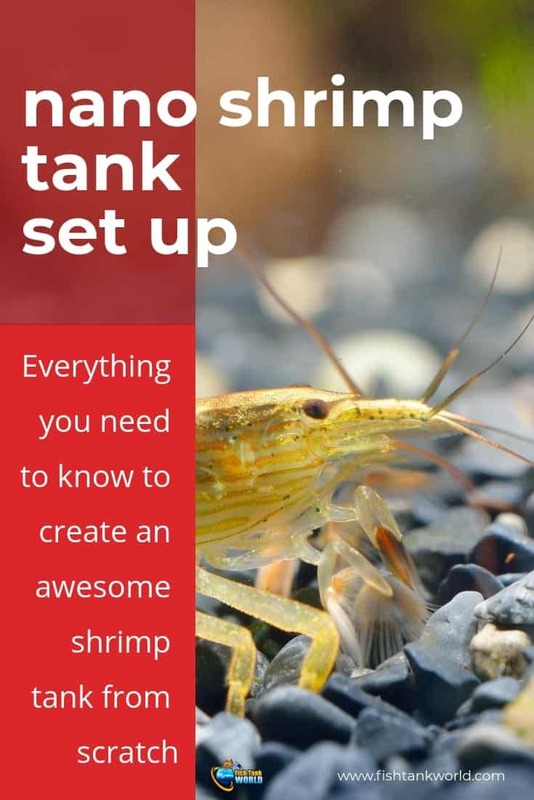 We’ll explain what you’ll need to create a proper nano-shrimp aquarium. Use this as a guide for building your own or selecting a pre-made nano aquarium kit. For best viewing and a sleek, modern look, look for a glass aquarium with curved edges. The smooth edges will make it easier to watch the shrimp behavior. Some nano aquariums are constructed with beveled glass edges. The 45-degree edges and clear silicone sealer make the tank appear to be made from a single sheet of glass. The high clarity glass gives the aquarium a crystal appearance and makes viewing the colorful shrimp, plants and ornaments enjoyable. Inexpensive plastic aquariums tend to have problems with distortion when viewed from the side. Glass looks great from any angle. A shrimp aquarium needs filtration but not a strong water flow. Most shrimp enthusiasts keep Neocaridina shrimp varieties that don’t require high water flow. Some nano aquariums are designed for live corals and reef creatures that enjoy wave-like water flow. Freshwater nano-shrimp prefer gentle water flow. Make sure the water filter has an adjustable flow control or check out this article on how you can reduce the water flow of your filter. If building your own shrimp tank, use a small nano-hang on back filter like the Aqua Clear Power Filter available on Amazon on different tank sizes. You’ll have to wrap a piece of netting or sponge on the filter’s intake screen. Curious shrimp can get their legs and body sucked into the intake screen of most power filters. The netting or sponge prevents this from happening. Tiny air-driven submersible sponge filters are also a favorite with shrimp-keepers. An air pump pushes air into the sponge filter, creating a lift as bubbles rise inside the uplift tube. This creates a slow, gentle flow through the sponge. Shrimp will climb onto the sponge, searching for bits of food and debris to eat. The downside is that you’ll have an unattractive old-fashioned sponge filter inside a beautiful modern nano aquarium. Air pumps can create a constant hum in the room too. You’ll have to wrap a piece of netting or sponge on the filter’s intake screen. Curious shrimp can get their legs and body sucked into the intake screen of most power filters. The netting or sponge prevents this from happening. Tiny air driven submersible sponge filters are also a favorite with shrimp-keepers. An air pump pushes air into the sponge filter, creating a lift as bubbles rise inside the uplift tube. This creates a slow, gentle flow through the sponge. Shrimp will climb onto the sponge, searching for bits of food and debris to eat. The downside is that you’ll have an unattractive old fashioned sponge filter inside a beautiful modern nano aquarium. Air pumps can create a constant hum in the room too. Neocaridina shrimp will thrive in cooler water (65-70°F). Warmer water (80-82°F) will speed growth and breeding activity but it comes with a cost. The increased metabolism will shorten the shrimp’s lifespan. A submersible heater is a good idea to maintain a stable water temperature. Wide fluctuations can be stressful. Many shrimp-keepers maintain a water temperature of 70-80°F. An aquarium heater will prevent the water temperature from dropping due to air conditioning and seasonal changes. Shrimp like to explore and sift through sand and gravel. You can use fine sand or regular aquarium gravel to line the aquarium. There is even specialty shrimp tank substrates that look natural and will help support aquatic plant growth like the Fluval Plant available on Amazon. If you plan on growing plants, a finer substrate will provide a better root environment than coarse gravel. You’ll want to see your shrimp display their full colors. Ambient lighting just won’t do it. Look for a nano aquarium with a LED lighting fixture. LED lighting runs very cool and won’t add excess heat to the water. It uses much less energy and lasts for years. Some of the higher end LED lights are adjustable, allowing you to set sunrise and sunset modes automatically. You can also adjust the color temperature to bring out and highlight the colors of the shrimp. Nano shrimp like places to explore and hide in. There are many shrimp-safe logs, houses and caves to choose from. You can also just add some large pebbles, a piece of aquarium safe drift wood and live plants. Your shrimp will constantly forage for microscopic food and algae that grow on the surface of plants, rocks and sand. They like to climb and hang on plants and logs. If adding live plants, look for plants that can survive in low light. Small nano tanks usually don’t have super intense lighting. Shade tolerant aquatic plants of java moss are the best choices. Nano shrimp need clean water without ammonia and nitrite. You can’t guess at water quality. Test kits are the only way to monitor and track the purity of the shrimp’s water. Over feeding with shrimp or flake food can pollute the water. The good news is that Neocaridina shrimp are not fussy about basic water parameters. Partial water changes with de-chlorinated water will help keep the tank clean and low in algae-promoting nutrients like phosphate and nitrate. There are many color varieties of Neocaridina shrimp ranging from red, blue, green, yellow and orange. It is recommended that only one variety be kept in an aquarium. While they are compatible, the shrimp will inter-breed, resulting in a tank full of drab, gray shrimp. Shrimp have a relatively short lifespan. Your aquarium will remain full of active, curious shrimp through breeding and regeneration of the population. Baby shrimp require no parental care and will eat the same foods as the adults. Therefore, select the color you like and watch them grow and reproduce! When you are ready to add shrimp to the new aquarium, place the shrimp and their bag water into a deep plastic bowl. Over the next 30 minutes slowly add a small amount of the aquarium water to the bowl. This will acclimate the shrimp to the aquarium’s water chemistry. The acclimation process should take about 30 minutes. A typical quart fish bag will need about a 3/4 cup of tank water during the acclimation process. Then, carefully net, cup or hand capture the shrimp and place them in the aquarium. Many fish are curious and will chase or nip at freshwater shrimp. 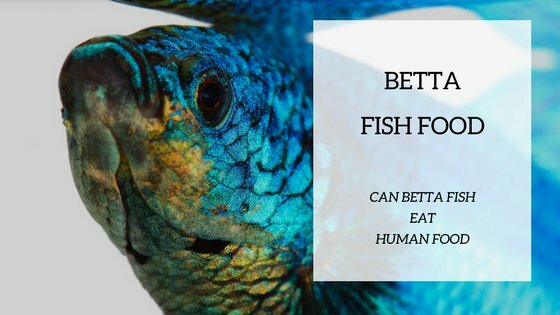 Large fish species will find shrimp very delicious! For these reasons it is recommended to keep shrimp by themselves. Snails are compatible and will help keep the glass clean. Your shrimp will feed on tiny plant material and biofilm that grows in the aquarium. They scavenge the aquarium, feasting of this microscopic food. Java moss is an aquatic plant that also supports a “zoo” of microscopic creatures shrimp love to eat. Java moss is like a jungle where the shrimp hunt their prey. They’ll also eat specialty shrimp pellets if the tank does not have a lot of natural foods. Be very careful not to over-feed the aquarium. It will cause a spike in ammonia and nitrite, which are lethal to shrimp. Once you’ve got the aquarium running and stocked with shrimp, you’ll have to take care of it. This is very easy, especially with a nano aquarium. Every two or three weeks, siphon out about 15% of the water. Replace it with dechlorinated water that is about the same temperature of the shrimp aquarium. Change the filter cartridge every month. 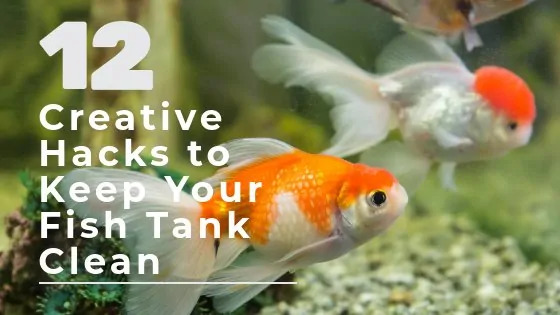 You may need to wipe the inside of the tank with a cloth to remove algae on the glass. Traditional algae scrapers may be too large to use inside the nano aquarium. Small magnetic algae scrapers will also work well for cleaning nano aquariums. Nano shrimp are fun and interesting to watch. They’re easy to keep and require very little care. You can even go away on vacation and not worry about feeding them. They’ll find natural food right inside the aquarium. With proper feeding and basic water care, your shrimp aquarium will provide years of enjoyment.